Oh, the stories I can tell!' 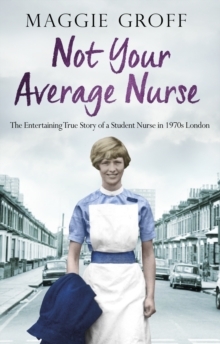 To a young girl the life of a nurse sounds exciting, but with long hours and short shrift it's never easy. So when Maggie Groff embarks on her training at London's King's College Hospital she must quickly get to grips with a demanding career. It's sink or swim. From the watchful gaze of stern sisters and the trials of nursing on a poor south-east London housing estate, to the explosive dramas of staff health checks at sophisticated Selfridges, Maggie shares warm and witty stories of mistakes and mayhem, tea and sympathy, and the life-affirming moments that make it all worthwhile. Played out against the march of feminism and fashion, IRA bombings and the iconic music and movies of almost half a century ago, Not Your Average Nurse is a delightful romp through time.